Above: Marilyn Shea-Stonum married her husband, Gary Stontum, at Crown College. Henry Chu (Crown ’72), history), a fellow classmate, took photos on the occasion.Some of Marilyn Shea-Stonum’s most treasured college memories are tied to Crown College, the third-oldest of the 10 residential colleges at UC Santa Cruz. Now, Shea-Stonum (Crown ‘69, history) has a vision for Crown’s future. She pledged a gift to Crown College’s endowment so that the college can continue to provide outstanding educational experiences for its students. This gift is part of a larger fundraising initiative led by Crown College alumni who plan to double the college’s endowment value from $1 million to $2 million by 2021, the 50th anniversary of the college’s pioneer class graduation ceremony. Using Cambridge and Oxford as a model, Chancellor Dean McHenry designed UC Santa Cruz to have semi-autonomous colleges within the university to give students easy access to faculty even while they were studying at a large research institution. Shea-Stonum remembers small courses taught by Page Smith and John Dizikes and conversations that extended beyond the classroom. One Thanksgiving during her senior year, she decided not to go home to Riverside for the weekend, and shared her plans with college preceptors Frank and Jean Andrews. Crown’s founding Provost Kenneth Thimann attended the Thanksgiving meal with his wife, Ann. “To this day, I view the conversation around that table as a watershed moment in sparking my desire for thoughtful and productive exchange,” said Shea-Stonum. Shea-Stonum became a bankruptcy judge and the editor for The American Bankruptcy Law Journal. As the editor, she implemented a peer review process for the journal that led to a great increase in citations. It is now one of the topcited law journals in the country. Shea-Stonum married her husband, Gary Stonum, at Crown College. Henry Chu (Crown ‘72, history), a fellow classmate, took photos on the occasion. Gary Stonum, at Crown College. Henry Chu (Crown ‘72, history), a fellow classmate, took photos on the occasion. When Chu reached out in 2016 about an alumni-led effort to fund the Crown library refurbishments, Shea-Stonum didn’t have to think long before joining the other 180 Crown alumni who donated. 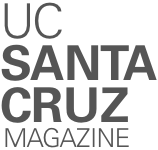 “Relatively modest gifts can make a big difference for the present and future of UC Santa Cruz,” SheaStonum said. When Shea-Stonum turned 70½, she pledged to give the minimum distribution requirements from tax-sheltered retirement accounts to supplement the Crown College endowment. The college plans to use the funding to support the Crown core course, a required writing course that explores topics on technology and ethics. By lowering the course size and incorporating alumni in the classes, current students will have some of the same meaningful exchanges earlier Crownies enjoyed. Manel Camps, the college’s current provost and associate professor of microbiology and environmental toxicology, is thrilled with the support. “Marilyn’s gift shows a commitment to grow Crown’s endowment so that its educational mission can be supported in the long term,” said Camps.